Gillette, population almost 22,000, is situated on the rolling plains of Northeast Wyoming, offering a mixture of contemporary living, wildlife and recreational opportunities, and minerals extraction. 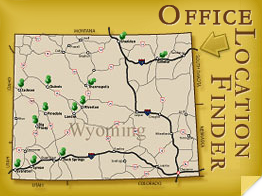 Many visitors come to enjoy the unique opportunities: climbing Devil’s Tower, touring coal mines, golfing where the antelope are the local hazard, and experiencing the Western ranch life. The abundant productions of coal, oil, and coal bed methane gas support Gillette’s claim of “Energy Capital of the Nation.” Over 30% of the nation’s coal supply is mined in Campbell County.